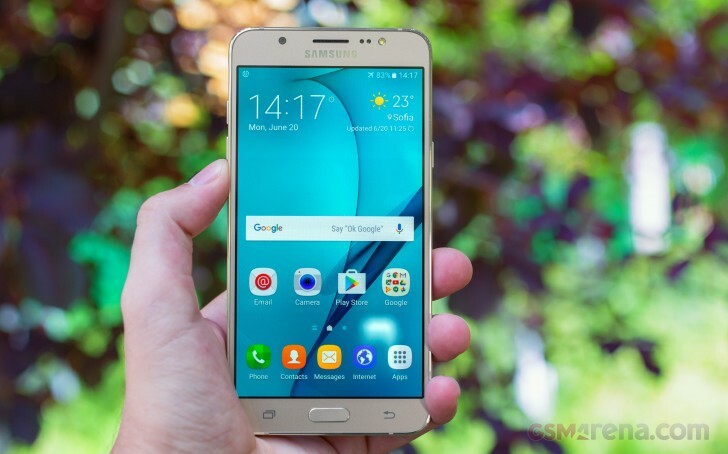 The Samsung Galaxy J7 (2016) boots up with Android 6.0.1 Marshmallow with TouchWiz UI on top. The latest available version of Android bundles cool features like native support for an app manager, Doze mode, and Google Now on Tap among other tweaks. The homescreen is perfectly identical to the TouchWiz home of other Samsung phones in the lineup. The Notification area is pretty busy by default. It starts with a scrollable line of quick toggles on top, then a brightness slider, then the S Finder and Quick connect buttons. You can hide them from the Edit option, which also lets you re-arrange the quick toggles. Don't like the default look of TouchWiz? No problem, as the Galaxy J7 (2016) user interface is fully themable. We only got three themes pre-installed, but the Theme store has many more to download. Overall, the latest iteration of TouchWiz manages to remain feature-rich, while also reasonably light on resources. As a result, it runs without glitches on the Exynos 7870 chipset with octa-core CPU. Speaking of which, follow us onto the benchmark section of the review.